Just when you thought the vaping industry had pushed product technology to the limit, up pops the iJoy Avenger 270 234W Voice Control TC Kit. As you might guess from the name, this is a voice activated mod which will have your head spinning at the thought of what you can do? Whoever thought of incorporating voice control technology into the iJoy Avenger 270 mod is a genius! Unfortunately, it is nigh on impossible to take your mind away from the voice-activated controls on the iJoy Avenger 270 mod. To say this is a unique “one-of-a-kind” vaping technology is probably underplaying the developments. Obviously, the first thing that hits you is the design of the iJoy Avenger 270 mod with the iJoy Avenger Subohm tank perched neatly on the top. As seems to be the norm these days, the range of different colours is endless, ensuring there is something for everybody and every occasion. You will soon find out that you can personalise the back colours to your particular preference, the display screen is bright and very easy to read and the design itself is compact, easy to hold and portable. As the name suggests, the maximum wattage on the iJoy Avenger 270 Mod is 234 W which is powerful to say the least. When enlarged TFT display screens became the norm many people wondered what was next - who would have guessed voice activation and artificial intelligence? Or is it a step too far for some people? What do you get with the iJoy Avenger 270 234W Voice Control TC Kit? The iJoy Avenger 270 234W Voice Control TC Kit includes two 20700 batteries with dimensions of length 70.1 mm and diameter 20.4 mm. 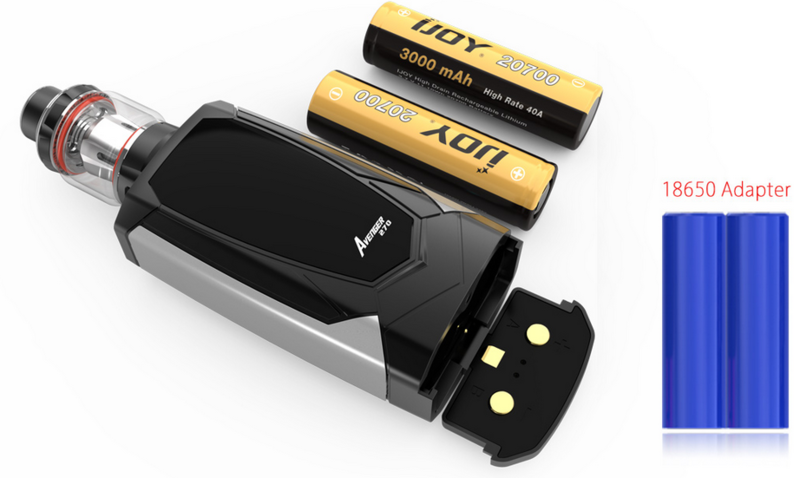 These rechargeable batteries have a peak voltage of 4.2 V, cut-off voltage of 2.5 V and a nominal voltage rating of 3.7 V. As we mentioned above, the TFT display screen shows the remaining capacity for each individual battery so that you can replace and recharge when required. 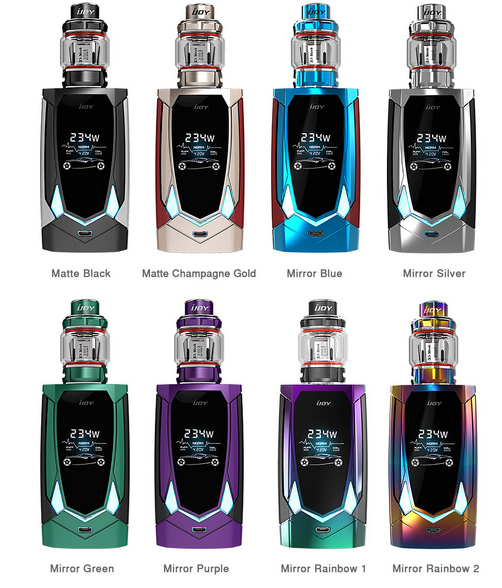 As you would expect from a top of the range vaping mod, not only is the Avenger Subohm tank just perfect but it also comes in a variety of different colours and glass sizes. The seven different colours include Black, Rainbow, SS, Champagne, Resin, Blue and White. The optional glass sizes allow reduced capacity of 3.2 mL or 4.7 mL, a choice which is purely down to the user. This is a top fill tank and there are opportunities to control the airflow and therefore control the type of vape you are after. 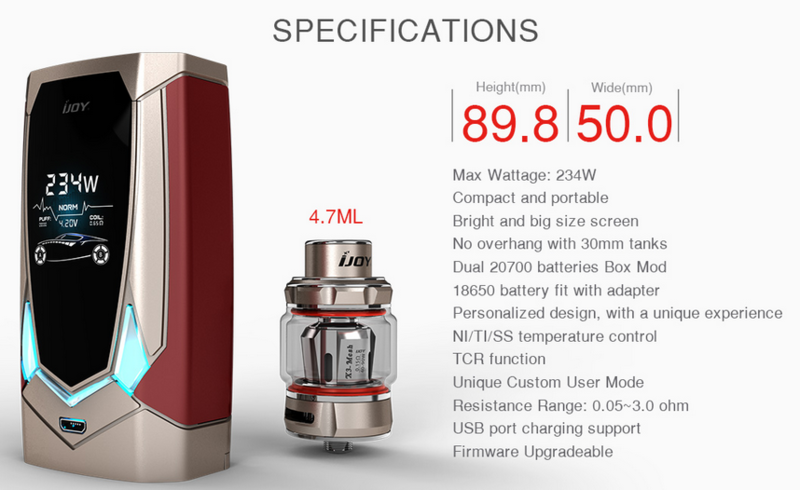 It would have been disappointing to find a tank which did not fit perfectly with the iJoy Avenger 270 mod when so much time and effort has been put into the latest technology. The tank and the mod fit like a glove. Apologies, we forgot to tell you that you can also instruct the mod to automatically find the optimum settings to maximise your vaping experience. You can literally change the settings second by second as you sit back, kick off those shoes and relax. 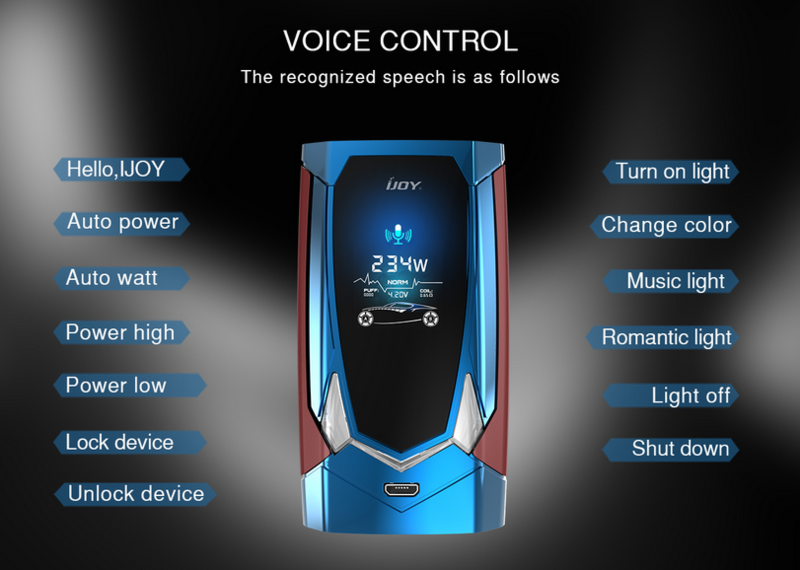 There is no doubt that the voice recognition element of the iJoy Avenger 270 mod will grab the headlines (why shouldn’t it?). 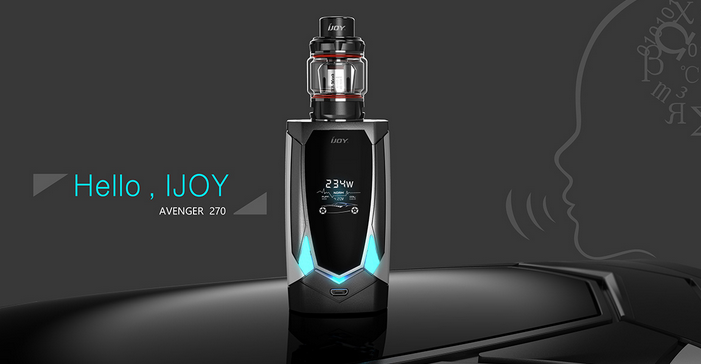 But there is much more to the iJoy Avenger than just voice recognition. The array of settings, lasting durable batteries, large tank, ability to produce vape clouds which will engulf or simply enjoy a bigger hit and less vape, is just the tap of a button or a voice instruction away. How cool is that?